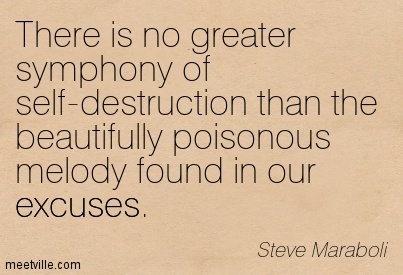 Excuses Are the Poison of Low Performance. – Whats your superpower? Excuses Are the Poison of Low Performance. Get a degree, work hard, and success will automatically follow. This is the success map that we are all given. Has anyone noticed that it’s broken? Business Strategist, popular speaker and ultra-runner Dan Waldschmidt refuses to accept business as usual. He says that this success map represents a model that is a false promise and I agree. The vast majority who have followed this model have fallen well short of their dreams and their potential. I have met many able employees who think that they’d be BETTER if they had MORE education. I’ve met those who work VERY hard but are depressed because they constantly get passed over for promotions or haven’t received an increase in their salary since “Lord knows” how long. The truth is that there are no guarantees regardless of the map you’re following or the formula you’ve been given. When I first started out on my own, my focus was on helping businesses with their sales and marketing efforts. Every business owner wanted a guarantee. They wanted to know upfront what results they would get when they placed the ad or sent out the revised brochure. In my ignorance I wanted so badly to please them and for many years after, I looked for formulas that would provide me with a guarantee that I could then pass on to my customers. Though many solutions guaranteed X or Y results I realized that there were other variables that needed consideration. And so the only comfort I could provide was improved results (no specifics) provided that their message, market and media were aligned. I subsequently became a champion of direct marketing which allowed for testing various elements of a particular strategy under real marketplace conditions. Dan’s work with entrepreneurs and companies reveals characteristics of low-performers and low-performing cultures. Although there are many qualities that can be named, the most poisonous is our tendency to make excuses – usually from those who’ve checked the boxes while following THE PLAN only to find that things don’t work out. You might find that it doesn’t work or that it might need some tweaking. Or you might just find that it works perfectly. You’re not going to find out ANYTHING until you first take action and then analyze your results. This is called taking responsibility for the results you’re getting and recognizing that the YOU element contributes greatly to the equation as well. If you don’t take responsibility for the results then you get to blame the formula or the solution. In other words you get to make an excuse as to why it didn’t work. Which brings us to the crux of the problem and why the success formula is broken and no longer works: the emphasis in the formula is on “doing” rather than on “being.” “Doing” is a prescription of activities, while “being” is about embodying your goals and drive. Dan suggests establishing a clearer picture of WHO YOU ARE and you may be asking the obvious question: How can I not know myself? That’s EASY! If you don’t know the REAL YOU, you are bound to make the same mistakes over and over again. “Before long, “Chu warns, “you might find yourself on the treadmill labelled ‘PROFESSIONAL VICTIM.’ You know…the people who say “Why does the world ALWAYS pick on me?” without questioning their own behaviour. On connecting with the REAL YOU Dan suggests scheduling intentional quiet moments of reflection. It sounds a bit New Age, but his point is that you cannot understand your core if you are crowding it constantly with “doing.” You need some time to touch base with your being. If you understand yourself and your uniqueness – you can develop extraordinary strategies to get ahead in your life and create the life you want. There is no “ONE MAP” for your SUCCESS. Your road map is going to change as your life changes and there are no guarantees but the drive from your BEING, knowing WHO YOU ARE is going to provide you with exactly what is necessary so that you can adapt and succeed! Grab my weekly newsletter – Chocolate for the Cranium™ here – It’s packed full of strategies and tools to help you to tap into WHO YOU REALLY ARE and develop the confidence to make decisions in your business and life from that place of certainty and trust.